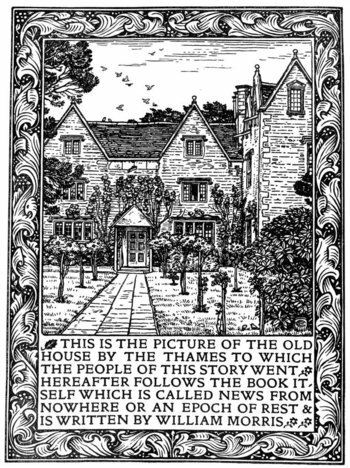 News from Nowhere is a utopian novel published in 1890 by William Morris. The narrator, William Guest, falls asleep and finds himself in the 21st century, in an idyllic agrarian society created following a socialist revolution. News from Nowhere was written as a riposte to Edward Bellamy's Looking Backward, a similarly structured Author Tract about a possible socialist future, but one which Morris hated for its utilitarian drabness. All Just a Dream: Ambiguously. Alliterative Title: News from Nowhere. Arcadia: Morris's vision of a future following a socialist revolution is this. Author Avatar: The narrator is clearly this. Author Tract: News from Nowhere is really just a means for Morris to describe his vision of a socialist utopia. Exty Years from Now: Played with. William Guest travels from 1889 to 2002, so neither the destination year nor the time gap is round number — but it's the same time gap used in Looking Backward, which was written a couple of years earlier and set in the rounded year 2000. Fish out of Temporal Water: The narrator. Meaningful Name: William Guest, who spends most of the novel as a guest in the utopian society. Solar Punk: A utopian novel from the late 19th century in which an author-insert character named William Guest travels to the year 2002 to find Britain transformed into a decentralized, egalitarian, and ecological paradise where the government has been turned into a dung market, people administer their communities through participatory democracy, war and poverty are distant memories, and even money no longer exists. Time Travel: The framing device, as the narrator falls asleep and wakes up in a utopian socialist future. Utopia: And the title is a nod to the original ambiguous coinage of the word, which could mean either "Good Place" or "No Place". The Watson: The narrator's role in the story is to be shown around and have everything explained to him.